Street food is the number one thing that I miss about living in the Philippines. Just like in most Asian countries, food carts vendors line up the streets ready to take orders. I remember ordering bbq on a stick from one of our neighbors that sold them right across from our house. Food brought a sense of community not only because we unsanitarily shared the same dipping sauce but this also lead to neighbors opening up about their day and so on. This Malaysian dessert dish is comprised of shaved iced and red beans. Through the years as popularity grew, more flavors and toppings were introduced. 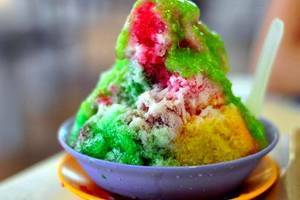 Some of those include durian, jelly, ice cream, aloe vera and even different colored dyes to change the ice. After all the toppings have been added it is often finished off by adding condensed milk. How can you tell good ais kacang from the bad? The consistency of the ice, it should be uniformed. Also a telltale signs are the conditions that the toppings are kept. Found on the streets of Mumbai, India, this vegetarian dish, the Vada Pav was originally concocted to feed hungry train commuters. Simple in form and in ingredients the Vada Pav is composed of a spiced potato ball, spiced in chickpea batter and then fried. Then it is laid on the Pav which is the bread and served with chillies and chutneys. 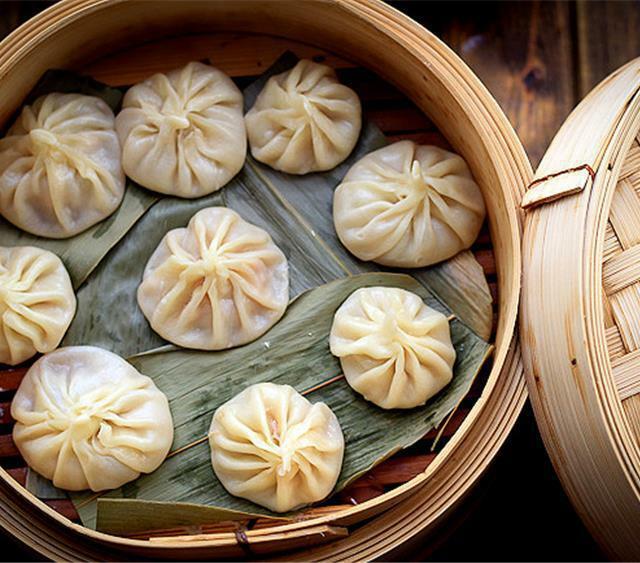 Xialongbao gets its name from the small steaming basket or xialong which it is prepared in. 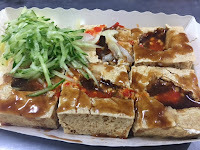 This steam bun dish is a popular street food in Shanghai and other Jiangnan regions in China. There are two types of buns used, white and translucent which is more common in the south or white and fluffy. Traditionally it has a pork filling and is what you would find in a dum sum (à la carte) setting. This is one street food that you might smell before you see it. Sure, it smells horrible but that shouldn’t dissuade you from trying it. It’s good I swear! very popular in the night markets of Taiwan, the tofu is deep fried then covered in chili sauce which might take away from shock for any westerners. Some people compare the taste to bleu cheese. 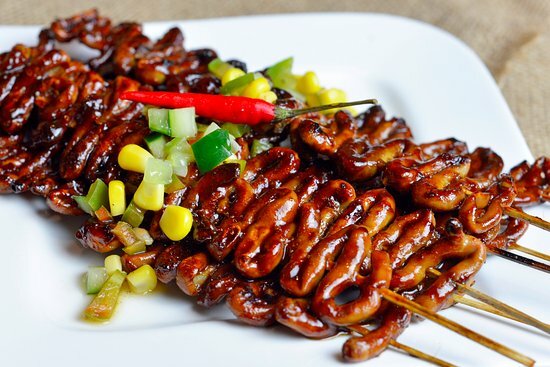 One of my favorites, Isaw are bbq’ed chicken/pig intestines found in the Philippines. They are cleaned thoroughly by turning it inside out cleaning it then boiling it. Not convinced just yet? Most the time you’ll be drunk when you’re eating this so you won’t care one bit for sanitation. All I can say is I once had to go to the hospital because I ate so much isaw and vinegar dipping sauce, that’s how good it is. A popular breakfast dish in Cambodia this breakfast dish is composed of rice noodles, pork broth, meat toppings ad herbs. If you’ve had Vietnamese Pho dish, this will be somewhat familiar. The dish can be served two ways, with the ingredients already mixed or with the soup to the side, allowing for a customized eating experience. 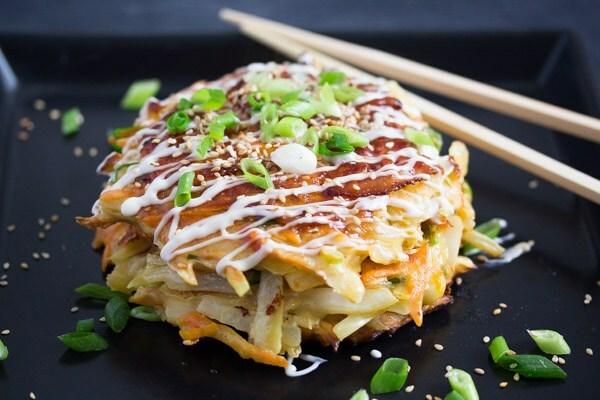 Think savory pancakes with a Japanse twist and that’s how I would describe an Okonomiyaki. There’s literally so many ways to prepare this dish because as the name would suggest “okonomi” or “what you want” you can basically put in all of last nights leftovers into this dish. The batter composed of flour, water, grated nagaimo, eggs, and various meats. It also resembles a Japanse style omellete. Each region has a different way of preparation and/or set of ingredients, but one thing ties all of them together and that is the euphoria that you get biting into one of them. South Koreans have a profound love for seafood. 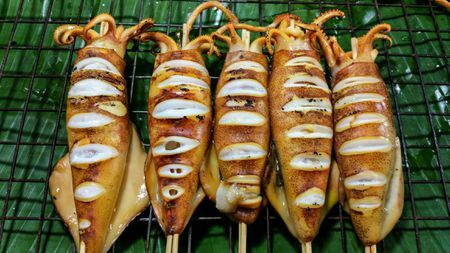 Grilled squid is a popular snack on the streets. For any westerner this might be a little out there but I can assure you that it tastes just like chicken! Not really but it sure is good. Not much goes into this dish in terms of ingredients, just the squid and the slight flavor of the charcoal. Kerak Telor is the signature street food of Indonesia. 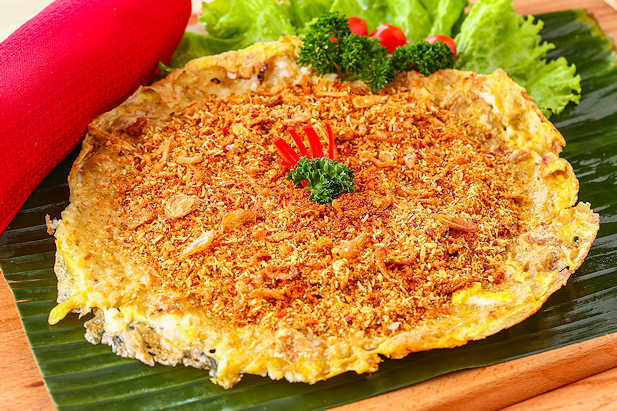 This dish is composed of a rice frittata cooked over charcoal that is then mixed with shrimp, coconut, seasoning and eggs. The dish is then cooked to a crisp, much like an omelet that you left on for too long because you didn’t want to miss a good part of a show. Pho is not the only street food that Vietnam has to offer. The bun rieu is vermicelli noodles covered in crab and tomato based soup which is then infused by Vietnamese herbs and water spinach. 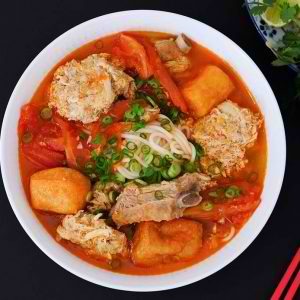 In this case, slices of tender pork legs and tofu puffs were also added to the soup, making for a perfect dish not only for its flavors but looks equally appetizing.